I really do. I drew them oh so long ago and have been wanting them back every since. Today’s comic is dedicated to Murphy’s Law. Thank-you. Corrected Swedish translation by Nirlem/Johnny Johansson. Thank-you! I second that emotion. They look good on Wiglaf, and they’d actually have a protective function if someone tried to put a blade to his neck. Also, neat work reflecting some of Wiglaf’s emotions using the glimmer on his chainmaille– it really does communicate his displeasure/apprehension quite well, like he shifted posture in reaction/preparation. Ha ha ha. XD Yay Murphy’s Law. Haha! Brat is hilarious. She’s absolutely ecstatic to be able to hurl insults again. 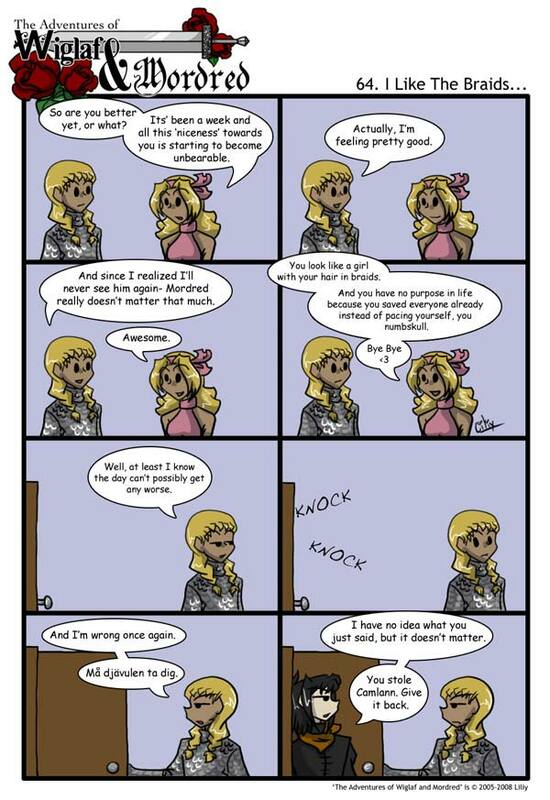 XD Well, at least she was compassionate enough not to kick Wiglaf when he was still feeling down. Mordred is hardly in a position to make demands. Wiglaf was the one who obtained the sword, and Mordred could only claim some kind of ownership of the sword as long as Wiglaf was his servant. Now that Mordred’s alienated Wiglaf out of his service, the sword belongs to Wiglaf automatically. Poetic justice, eh? ….i don’t. ;_; i want subtitles and/or translations!!!! Ps: My english isn’t the best. How come no one’s wondering how it is Mordred knows where Wiglaf lives?